Credit: T. Yamano and H. Nishimasu discovered and published the coordinates of each atom in the protein-DNA complex. James Rybarski used those coordinates and software called PyMol to generate this illustration…. Among the most significant scientific advances in recent years are the discovery and development of new ways to genetically modify living things using a fast and affordable technology called CRISPR. Now scientists at The University of Texas at Austin say they've identified an easy upgrade for the technology that would lead to more accurate gene editing with increased safety that could open the door for gene editing safe enough for use in humans. 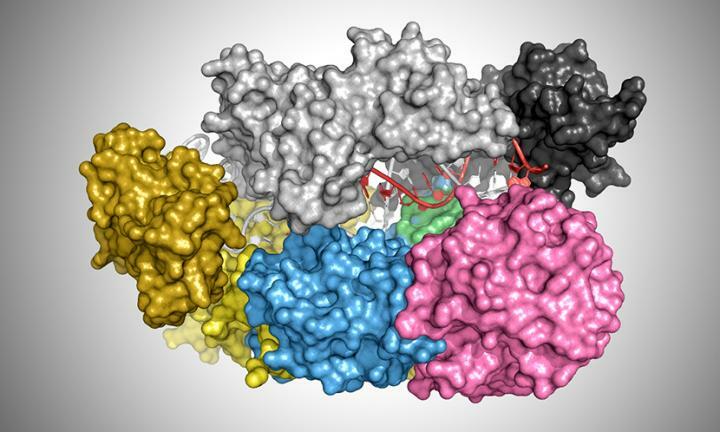 The team of molecular biologists found conclusive evidence that Cas9, the most popular enzyme currently used in CRISPR gene editing and the first to be discovered, has less effectiveness and precision than one of the lesser-used CRISPR proteins, called Cas12a. Because Cas9 is more likely to edit the wrong part of a plant's or animal's genome, disrupting healthy functions, the scientists make the case that switching to Cas12a would lead to safer and more effective gene editing in their study published Aug. 2 in the journal Molecular Cell. "The overall goal is to find the best enzyme that nature gave us and then make it better still, rather than taking the first one that was discovered through historical accident," said Ilya Finkelstein, an assistant professor of molecular biosciences and a co-author of the study. Scientists are already using CRISPR, a natural mechanism used by bacteria to defend against viruses, to learn more about human genes, genetically modify plants and animals and develop such science-fiction-inspired advances as pigs that contain a fat-fighting mouse gene, leading to leaner bacon. Many expect CRISPR to lead to new treatments for human diseases and crops that have higher yield or resist droughts and pests. But the CRISPR systems found in nature sometimes target the wrong spot in a genome, which–applied to humans–could be disastrous, for example, failing to correct for a genetic disease and instead turning healthy cells into cancerous cells. Some previous studies have hinted that Cas12a is choosier than Cas9, but the research before now was inconclusive. This latest study, the researchers say, closes the case by showing that Cas12a is a more precise gene-editing scalpel than Cas9 and explaining why. The team, led by graduate student Isabel Strohkendl and professor Rick Russell, found that Cas12a is choosier because it binds like Velcro to a genomic target, whereas Cas9 binds to its target more like super glue. Each enzyme carries a short string of genetic code written in RNA that matches a target string of genetic code written in the DNA of a virus. When it bumps into some DNA, the enzyme starts trying to bind to it by forming base pairs–starting at one end and working its way along, testing to see how well each letter on one side (the DNA) matches the adjacent letter on the other side (the RNA). For Cas9, each base pair sticks together tightly, like a dab of super glue. If the first few letters on each side match well, then Cas9 is already strongly bound to the DNA. In other words, Cas9 pays attention to the first seven or eight letters in the genomic target, but pays less attention as the process goes on, meaning it can easily overlook a mismatch later in the process that would lead it to edit the wrong part of the genome. For Cas12a, it's more like a Velcro strap. At each point along the way, the bonds are relatively weak. It takes a good match all along the strip for the two sides to hold together long enough to make an edit. That makes it much more likely that it will edit only the intended part of the genome. "It makes the process of base-pair formation more reversible," Russell said. "In other words, Cas12a does a better job of checking each base pair before moving on to the next one. After seven or eight letters, Cas9 stops checking, whereas Cas12a keeps on checking out to about 18 letters." The researchers said that Cas12a still isn't perfect, but the study also suggests ways that Cas12a can be improved further, perhaps one day realizing the dream of creating a "precision scalpel," an essentially error-proof gene-editing tool. "On the whole, Cas12a is better, but there were some areas where Cas12a was still surprisingly blind to some mispairing between its RNA and the genomic target," Finkelstein said. "So what our work does is show a clear path forward for improving Cas12a further." The researchers are currently using these insights in a follow-on project designed to engineer an improved Cas12a. The study's other co-authors are graduate student James Rybarski and former undergraduate student Fatema Saifuddin. This work was supported by grants from the National Institute of General Medical Sciences and the Welch Foundation.